Carbon monoxide is known as the silent killer. You can not smell, taste or see that it is there. Carbon monoxide (CO) is generated as an off gas from items such as boilers, gas heaters, gas stoves, and gas fireplaces. When the carbon atoms in these gas products do not oxidize properly the reaction forms carbon monoxide instead of a much safer gas known as carbon dioxide. Carbon monoxide binds to the hemoglobin in your blood preventing oxygen in the air from binding to the same hemoglobin. This causes a lack of oxygen to the body and will result in death if not removed from the environment. If carbon monoxide is being produced than something is wrong. Your gas boilers or gas heaters is not working properly. So how will you know this is happening? Most people are familiar with smoke alarms. Well there is also a similar alarm called a carbon monoxide detector. Technology has advance to where you can even purchase a combined alarm that detects both. 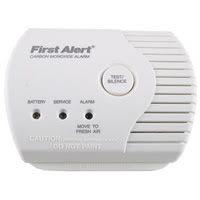 Your church should have carbon monoxide detectors any time that there is a chance of producing carbon monoxide. Some examples or locations to start are near mechanical spaces, kitchens and basements. Carbon monoxide does not stay in one place. Don’t limit your protection to only where you think the source could come from. Have carbon monoxide detectors spread out all around your facility.